I am in love with these candy/ice cube molds from ModFamily. They are so much fun they are shaped like lego blocks, lego people, and guitars. You get three different trays that are made of silicone. Since they are silicone they are really easy to use and they just pop right out. They don’t stick at all. You can use these for a ton of different things really, they are very versatile. 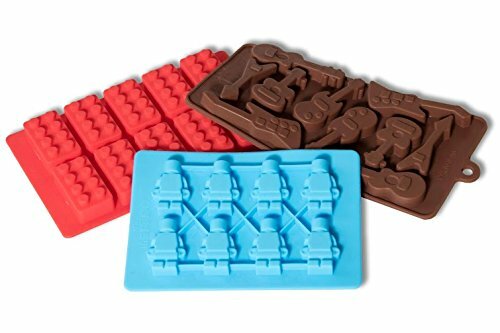 You can use them for chocolate, gummies, ice cubes, even things like wax crayons. They work perfect. The detail on them is so neat! Even the blocks have the little knobs at the top. There are a ton of recipes out there for different items you can make with these. They are a ton of fun.